Fiction – hardcover; Doubleday; 400 pages; 2012. Review copy courtesy of the publisher. It is that blurring of lines between right and wrong that later come back to haunt Tom. And, through an amazing coincidence, so, too, does the woman. But let me backtrack. This novel, which is the first by Australian-born, London-based Stedman, was apparently subject to an international bidding war by nine publishers keen to acquire rights to it. I’m not surprised. This is one of those rare books that is so captivating and heart-rending that it leaves you feeling bereft — and cried out — when it ends. It is set mainly in the 1920s on a remote island off the coast of Western Australia, where the Indian Ocean meets the Great Southern Ocean. Tom works for the Commonwealth Lighthouse Service running and maintaining the lighthouse. It is a lonely life, but when he meets and woos Isabel during some rare onshore leave, he brings her back to the island as his wife. Their idyllic existence is ruined by a succession of miscarriages and a stillbirth that plunge the couple into despair. But one day, a dinghy washes up on their little beach containing a dead man and a “woman’s soft lavender cardigan wrapped around a tiny, screaming infant”. Despite Tom’s reservations — he’s a stickler for rules and order — the couple decide to keep the baby, whom they call Lucy, and pass her off as their own daughter. Their isolation and lack of contact with other humans, save from the boatmen that bring them occasional supplies, means their subterfuge can be carried out relatively easily. But when they go on their first shore leave, some two years later, the impact of their decision hits them in an unexpected way: a local widow, ravaged by grief, is still looking for her baby, believed lost at sea. As Tom and Isabel’s secret begins to unspool, the small rift in their marriage widens into a gulf — Tom, who has never been comfortable with their decision, now wants to do the right thing and tell the authorities; Isabel, who believes Lucy was a “gift from God”, wants to carry on as if nothing has happened. Who is right? What impact will it have on Lucy if her parents decide to come clean? And will the real mother be any happier having a child she has not brought up returned to her? The Light Between Oceans charts the impact of one fateful decision on both the “fake” parents and the real mother. It also reveals the impact on others unwittingly caught up in the subterfuge, such as Isabel’s parents, who are much devoted to their only grandchild. By setting the story in the aftermath of the Great War, Stedman is also able to highlight other issues, such as the importance of family when so many sons had been lost on the battlefields of Europe, and the ways in which small-town communities can band together to ostracise people perceived as being different. It’s not a perfect novel — I felt Isabel’s motherly devotion was sometimes too contrived and Tom’s never-ending patience unrealistic — but it is an intelligent, page-turning read. And the ending, so beautifully and touchingly rendered, means only a hard-hearted reader won’t want to cry buckets over it. 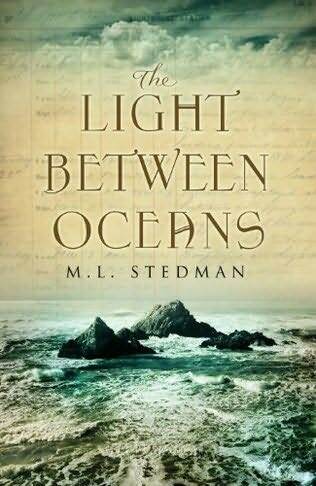 The Light Between Oceans is published in the UK tomorrow. There are a lot of positive reviews of this one going around at the moment! I’ve chosen this book for my bookclub – I’m pretty excited about reading it now that I’ve read your review. I’m sure if I read the book the ‘dead man and a baby in a boat’ part would be smoothed out and not sound so sensational but I have to say I rolled my eyes and said, “Really?” when I read that part. It’s an excellent choice for a book club — so much stuff to discuss, lots of moral dilemmas/issues etc. Ah, that’s my fault. It’s not quite as clunky in the book — and actually, it isn’t as contrived as it sounds. There’s a reason why the man is the boat with his infant daughter. It makes sense when you read the book. I thought it was an excellent plot device. That’s just what I thought! It’s already on my wishlist based on other people’s review and after reading this review, it’s definitely staying there (until I get a chance to buy/borrow it, of course). Ah! That came out poorly. Wasn’t trying to say the review was clunky. Not at all. After you’re further explanation I’m truly curious! I have this on the shelves and am really looking forward to reading it. This is in part due to your wonderful review which has me itching to reach for it now, but also because it was on The First Tuesday Book Club and Marieke Hardy utterly loathed it, which of course makes me want to read it even more.